President Trump just announced he feels he is too successful to be impeached. I adamantly disagree, as I am sure do millions of other Americans. No one is ever too good to be “shown the door” if he or she fails to live up to the standards of a role that person has sought out and then undertaken. Plus, in this scenario, success is in the (blind) eye of the beholder. While Trump thinks he has been a success, the majority of intelligent Americans do not. Since the start of the Trump administration, I’ve waffled on whether I thought impeachment was warranted. I have been flabbergasted at Trump’s delusions, propensity for bad behavior, and glaring lack of competence as a skilled leader, but impeachment is a long and potentially chaotic process, wrecking havoc on our society and with uncertain consequences. I have waited for Trump to mature or show some depth. At some point I realized this is not going to happen. He is incapable of being a dignified and competent president. Thus, it is time for others to mature, get some back bone, and face the fact that impeachment and removal are in order. Congressional Democrats need to stick together against a common enemy and not start picking each other apart or resorting to vulgarity that only alienates. Congressional Republicans need to quit worrying about their re-election chances and acknowledge the sad fact that they are supporting a man who is a disgrace to the country and an embarrassment to polite company. If he worked for me, I’d fire him. If he were my neighbor, I’d build a very tall fence (no joke intended). I believe there are some individuals who don’t have much to offer this world; he is one of them. Impeachment is chaotic, but we already have chaos in the White House and it is permeating all aspects of our society. This turmoil will continue unabated until a new order is established. The impeachment process could return a feeling of control to those Americans who still believe the president “works for the people” and that in spite of everything, their voices continue to count for something. If successful, the end result could restore confidence in the American political system, both here and abroad. While a Pence administration is nothing I crave, I don’t see how it could be worse than what we currently have. Sometimes a chance is worth taking. Trump is not going to change. He is a petulant bully, a narcissist, and a bane on American society. Impeachment is difficult, but it is a potential light at the end of a very dark tunnel. Those with the power, regardless of political affiliation or pressure, need to reflect on what is right for this country and acknowledge that sometimes drastic times call for drastic measures. 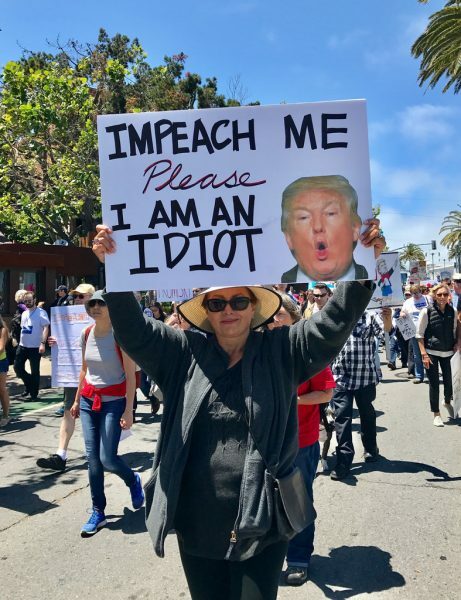 Impeachment remains the only viable route to ending the Trump Presidency unless the Mueller investigation uncovers enough evidence to indict the President. I join you in your desire to excise this cancer on our Democratic process and the rule of law.